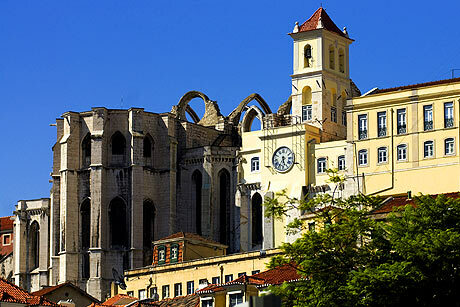 One of the most dramatic tourist sights in Lisbon refers to the roofless Carmo Convent and Church. This is not a place of worship proper, given at present it is more of a ruin than a functional church, but the traces of the former medieval religious edifice call forth the splendor of what the convent and the church used to be. The monastic complex was built between 1389 and 1423 by order to Nuno Alvares Pereira, a powerful knight, head of the Portuguese army (second in importance after the king). It was initially bestowed to the Carmelite order, but it lost its functionality after the great earthquake of 1755, when much of the edifice was damaged apparently beyond repair. However, what is worth mentioning is before the earthquake, the Carmo Convent and Church represented the height of all Gothic religious edifices in Lisbon. At present, the complex is home to the Carmo Archeological Museum. It is located in the Chiado district, and it is well worth a visit by tourists who want to sample what is best in Lisbon in terms of historical and archeological sites.